Of the Latin American writers I most admire—Mario Vargas Llosa, Gabriel García Márquez, Carlos Fuentes, Roberto Bolaño—all were recipients of an award named after Rómulo Gallegos. A teacher, writer, and one of the founders of Acción Democrática—an important political party in the early years of Venezuelan democracy—Gallegos became the first democratically elected president of Venezuela in 1947. But in 1929, he was forced to flee the country after publishing a novel critical of the regime of Juan Vicente Gómez. 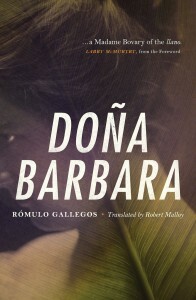 That novel was Doña Barbara. 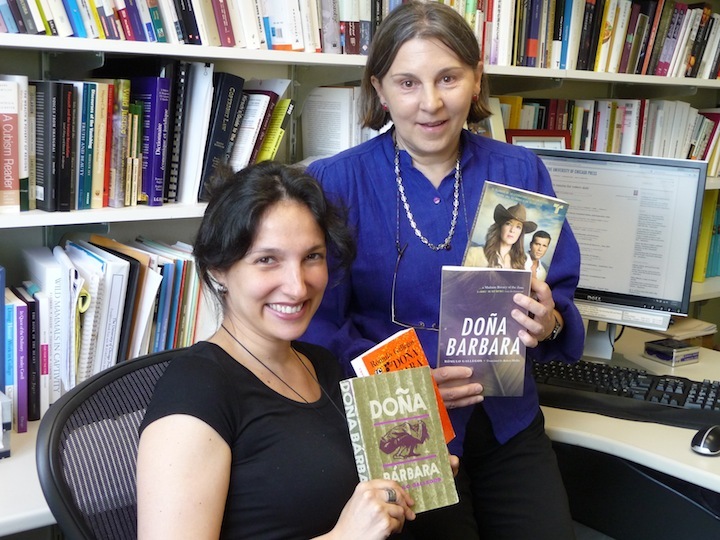 When Inés ter Horst, our foreign rights manager (who is Venezuelan) recommended we consider the book for reprint, I had trouble locating a single review of the 1931 English translation, let alone a copy to read. 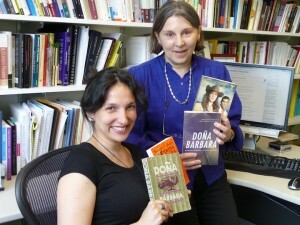 Doña Barbara had been out of print for decades, its publisher long out of business. I feared this might take weeks of research and then turn out to be hopelessly dated. Then, that very week, a cowboy with flashy eyes and a jaunty hat passed me on a Chicago street — a bus carrying an ad for Doña Barbara, the Telemundo soap opera series based on this very novel! Maybe the llanos of Venezuala weren’t so distant after all? I went back to Inés and asked her to tell me more. Finally a musty-smelling book arrived in the mail. At first glance, Doña Barbara is, well, long. Not as long as Gone with the Wind or The Grapes of Wrath, but as long as other classics you might have been assigned in school. The story pits an educated, principled land-owner against a beautiful and tyrannical cattle-rustler, Doña Barbara, rumored to be a witch. One of the first examples of “magical realism,” it is an epic, a love poem to Venezuela: the land, its peoples and their legends. It’s also a romance, a political parable, a story of cowboys, spirits and hustlers, and the strange magic of history. From the first page, I was wowed by Robert Malloy’s beautiful, poetic translation of Gallegos’s language: an eerie description of the river and the sense of danger hovering over the young Santos Luzardo. By the time I’d gotten through visions of dawn on the prairie, with “the smell of mint and cattle” and encountered Pajarote’s stories of vampires and ghosts, and the legal/political shenanigans of the gringo bully “Sr. Danger,” I was ready to gallop out onto the Venezuelan llanos myself and lasso the rights. But we still had no leads on whom to contact. So it was Inés who ventured to Venezuela, via the Guadalajara book fair, where she left a hand-written note inquiring after the English language rights at the Cuban-Venezuelan stand. A month later, an e-mail from the Cuban Ministry of Culture landed in Inés’s inbox, suggesting she get in touch with the CELARG, in Caracas, Venezuela (Centro de Estudios Latinoamericanos Rómulo Gallegos). After several days of phone calls, she finally reached the head of Publications, who referred her to Rómulo Gallegos’s daughter. (He had a daughter! We had a phone number!) Encouraged, Inés kept phoning and writing Venezuela until she managed to negotiate the rights. She even recruited relatives to help us resurrect this Venezuelan masterpiece: her father hand-delivered the license agreement to Rómulo Gallegos’s daughter, and Ines’s uncle, who happened to be in Venezuela at the time for business, transported the signed agreement back to The University of Chicago Press for its countersignature. After almost six months, we had a deal. Larry McMurtry—whom you will have heard of—not only writes westerns, but also loves old books. And since Doña Barbara is about cowboys, love, land, power, and justice, we sent him the book, in its old-fashioned looking 1931 cover, hoping he’d recognize a kindred spirit. Maggie Hivnor is the Paperback Editor of The University of Chicago Press. For over twenty years she has been acquiring reprint rights to works in all fields, including fiction.